By my count I have 150+ books on my Amazon wishlist and the thing is- half the time I can't remember why I put them there. 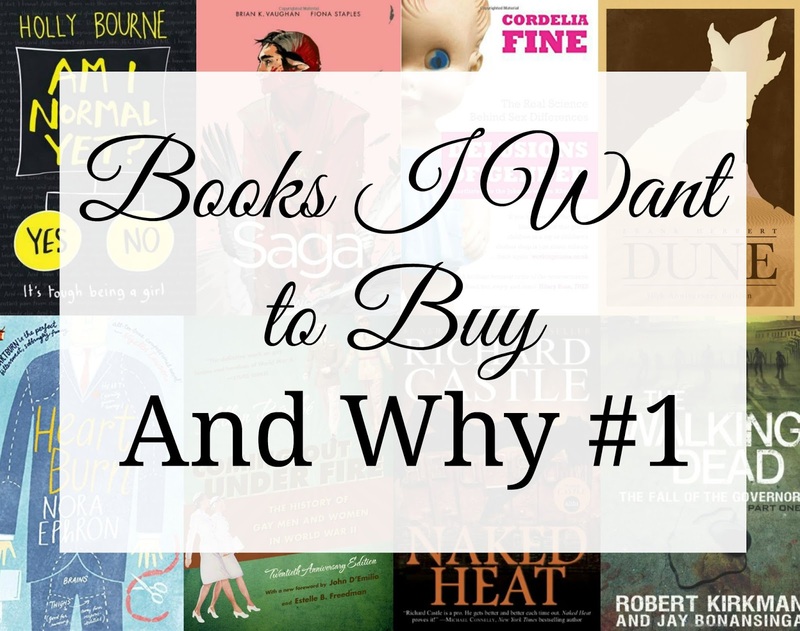 So here is my new series where I show some books I want to buy and say why. Then if you, my dear readers, have read them and think they should be bought right away then consider me enabled. If you want to see a review then I'm sure I can be easily convinced. And if you think they should be struck from the list then better I find out now then after spending money! Nora Ephron wrote my all-time favourite movie; You've Got Mail. So when I found out that she had written books, I immediately wanted them all. I added Heartburn because the story sounded like something I'd really enjoy reading. Love? Betrayal? Loss? Revenge? All things that make a good read for me. But it's not a huge priority right now. This is the most expensive book on my entire wishlist at £27.95, but also the book I want most. I saw this referenced on some website and gay people in the military is just one of those things I find myself wanting to read about. Especially since WWII was pre-Don't Ask, Don't Tell and I'm fascinated by the time in general. Consider this top of my Christmas list, I don't really want anything else but this book. The first Nikki Heat book; Heat Wave was the book that really started it all for me back in January 2014 and although I wasn't blown away, I'd like to continue the series eventually. I may or may not have just bought the Castle graphic novels (haul coming soon) so they might rekindle my love for the books and convince me to add this to the cart. The Walking Dead is a huge part of my life. I met some of my best friends through the show, the comics were some of the first comic books I ever read and the books were some of the few books that I read when I wasn't really reading at all. But I only have the first two in the series; Rise of the Governor and The Road to Woodbury so after I re-read those I'm sure I can convince myself to buy this. As someone who has struggled with OCD since I was young and has gone through recovery periods and relapses aplenty, I'm interested to read a YA book about it. Knowing that Lauren loved it makes me pretty sure that I'll love it too. Everyone and their mother seems to be reading Saga lately. I got my volume 1 trade way back when it first came out, added the second volume to my wishlist and since then it's kind of fallen off my radar. But lately I've been reading more of my comics and I trust Brian K Vaughn's writing a lot since he wrote my favourite comic book; Y: The Last Man. I'm going to re-read Volume 1 and finally buy this soon. I'm fascinated by gender and its role in society. I have a few gender neutral and gender fluid pals and I'm always up for learning more about things like this. You hear a lot of unbacked statements about the differences between the sexes so actually learning the science is going to be my way of staving off ignorance, developing my own opinion and making sure I can back up my thoughts with actual facts. I'm pretty embarrassed that I haven't read this one. It's constantly mentioned on /r/books and sounds right up my alley. Science-fiction is my favourite genre but it's the hardest to get right, in my opinion, so a classic like this is probably the way to go for a decent sci-fi read. And it just hit it's 30th anniversary so there's a very pretty new cover out. So those are some books I want to buy and why! What do you think of my picks? 5 Things to do in Autumn! Book Review: Asking For It by Louise O'Neill.